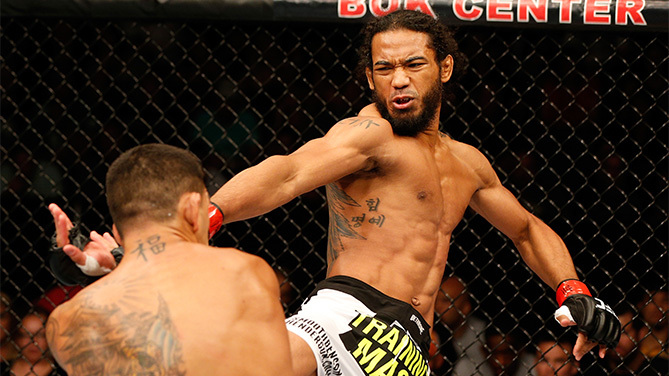 When asked how he would hype his co-main event clash against Donald Cerrone this Sunday night, former UFC and WEC lightweight champion Benson Henderson answers succinctly that it’s my job to perform on the page and his to inside the Octagon. Three fights and about 17 months removed from dropping the 155-pound strap at UFC 164, “Smooth” still carries that championship glitter into each of his bouts, regardless of opponent or spot on the card. It’s almost impossible to tarnish someone who has shined so brightly to have won a UFC belt with a loss or two, let alone Henderson with his three successful UFC lightweight title defenses and nine wins inside the Octagon. The 31-year-old fought in three main events in 2014, which resulted in mostly positive results and featured a pair of firsts - good and bad. 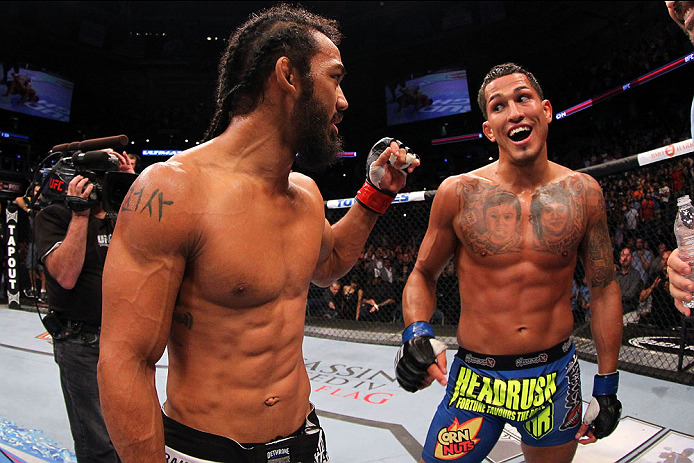 In January, Henderson earned a split decision over former Strikeforce lightweight champ Josh Thomson. In June, he scored his first finish inside the Octagon with a rear naked choke of Rustam Khabilov, after which he was awarded a Performance of the Night bonus. Yet in August, Henderson was stopped with strikes for the first time in his 25-fight pro career by current #1 contender Rafael dos Anjos. Getting better is not about major changes considering a 21-4 pro record suggests Henderson already has the recipe for success. “If you always get 1% better then there is always room for growth,” Henderson said. For Smooth, the incremental daily climb toward “better” revolves around a tried and true idea: hard work. Putting in the hours has been the name of Henderson’s game from his days on the wrestling mats at Decatur High School and Dana College to the team practices at the MMA Lab in Arizona with head coach John Crouch. Up next, Henderson will aim to get back to his winning ways at UFC Fight Night: McGregor vs. Siver against an old and familiar foe: Donald “Cowboy” Cerrone. Originally, he was set to scrap with the heavy-handed Eddie Alvarez, but Alvarez withdrew and the division’s charismatic gunslinger stepped up on short notice. Earning a most recent unanimous decision win over Myles Jury only two weeks ago at UFC 182, Cowboy is enjoying a thoroughly impressive six-fight win streak, including four finishes and four bonuses. Thus far, Cerrone has impressively cut a path through the division towards a title fight, but now, Cowboy will contend with Smooth, who owns two wins in the pair’s previous two meetings. 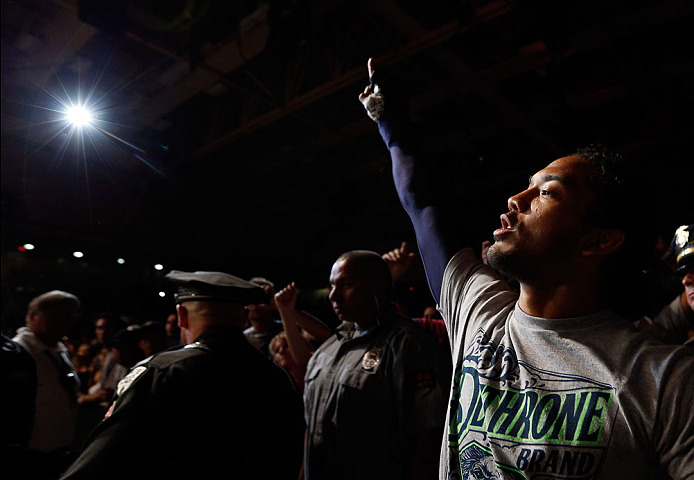 It’s been five years since Henderson got his hand raised for the second time against Cerrone. Both bouts were in the WEC and both had the WEC’s lightweight title on the line. In the first, the duo delivered a Fight of the Night at WEC 43 with Henderson winning a unanimous decision, and in the second, Smooth secured a lightning-quick guillotine choke at WEC 48, earning a Submission of the Night bonus. Cerrone’s gamble to take this fight is to keep his streak alive and get some revenge in the process, but Henderson will be just as geared-up for Cowboy because Smooth is simply ready for any and all comers. On January 18th in Boston, Cowboy and Smooth will collide for the third time with Henderson’s sights set on another W-getting great performance for no other reason than it’s his job.